David Blackwell was born in 1961, grew up in Oxford, and studied music at Edinburgh University, graduating First Class in 1983. He worked for many years in music publishing, becoming Editorial Director at ABRSM Publishing and Head of Music Publishing at Oxford University Press. He now works as a freelance composer, arranger, writer and editor. With his wife Kathy, he has written and published award-winning books for young string players: Fiddle Time, Viola Time, Cello Time and a number of ensemble collections. Kathy and David have presented workshops on string teaching across Europe and in Australia, Singapore and Hong Kong, and in 2017 received an ESTA UK award in recognition of exceptional services to string teaching. David has sung in and conducted church and concert choirs throughout his life, and has written and arranged a variety of choral pieces, from anthems and carols to concert encores. For Oxford University Press he co-edited In the Mood – choral arrangements from the Great American Songbook – and (with Bob Chilcott) Carols for Choirs 5, published in 2011 to mark the 50th anniversary of Carols for Choirs 1. He has written educational music for piano, published by ABRSM and OUP, and his music has been selected on music exam syllabuses. He plays the cello, piano and organ, passing the FRCO exam while at university, and has written and published a number of organ pieces. 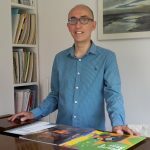 He has also worked as a freelance project manager for music publishers C. F. Peters and ABRSM, and written articles on choirs and choral music for Choir & Organ magazine. David Blackwell is an award-winning composer and freelance arranger, writer and editor. His educational, choral and organ music is published in the UK and US and performed worldwide. He also works as a freelance publisher for several UK music publishers and writes for Choir and Organ magazine.